The Irish government is fighting compensation claims by children who developed an incurable sleeping disorder after getting the Pandemrix swine flu vaccine. This is despite a Government-commissioned report saying the Pandemrix jab left susceptible children at 14 times greater risk of developing the condition. It said other “unspecified factors” may also have played a role. The first legal stage of the cases will come before the High Court next week when an order for discovery of documents from the Department of Health and the vaccine manufacturer GlaxoSmithcline (GSK) will be sought. Solicitor Michael Boylan of Augustus Cullen Law, who represents 60 of the children, revealed yesterday that he is shocked the State is denying liability and fighting the families. It is denying it owes a duty of care to the children who received the vaccine. Mr Boylan said the Irish expert group found a 14-fold increase in the incidence of narcolepsy among children vaccinated, compared to those who did not get the jab. The untested vaccine was rushed out during global panic over the swine flu pandemic in the winter of 2009 and 2010. The pandemic turned out to be much milder than feared but parents were strongly urged by senior medical officers in the Department of Health and public health experts to have children, who were a risk group for the virus, vaccinated. However, some 80 children who received the vaccine went on to develop the sleeping disorder narcolepsy. The rare disorder causes people to feel drowsy or to suffer spontaneous ‘sleep attacks’. They can sometimes experience loss of muscle power and fall. This can be triggered by stimulus like laughter. All of the young people, many of whom are now teenagers or young adults, are on medication to stay awake during the day or sleep at night. Mr Boylan said the children allege negligence by the State and GSK in the circumstances where they were administered an untested vaccine and/or that the vaccine was a defective product. Parents were not made aware of the fact that it was untested, he added. At the time the vaccine was issued, GSK got the then government to grant the drugs giant indemnity from any potential compensation claims. Mr Boylan said: “Other countries like Switzerland, America, Poland and Australia would not give a licence to the vaccine. He said boosters were included in the vaccine, which increase the body’s immune response to the jab. Children in several other countries have been compensated; some through no-fault vaccine redress schemes. In the Netherlands, some children have got payouts of nearly €1m and the sums demanded here are likely to be in seven figures, he added. He said the health effects are devastating for many of the children. Most also have cataplexy, in which they “collapse like a puppet” and have suffered accidents like falls down stairs or crashes through glass panes in showers. Mairead Hilliard, whose son Alex (11) developed narcolepsy after the jab, said yesterday the condition has left the young people on life-long medication and at risk of never meeting their full potential. The compensation is needed because of the debilitating effect it has on their ability to live a normal life, she said. They are all growing up now and some are students who find they are fighting the illness all the time, and there is no cure for it, she added. 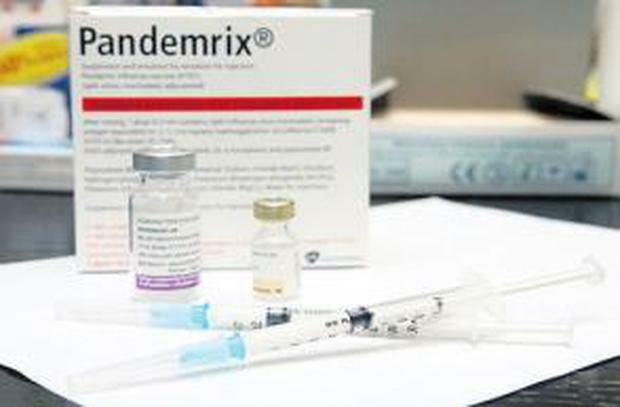 Pandemrix, a vaccine used in response to the swine flu pandemic that began in 2009, increased children’s risk of narcolepsy – a chronic disorder which causes excessive daytime sleepiness, research suggests. For every 55,000 doses delivered around one child developed the condition, said health experts. The research, published in the British Medical Journal, examined 75 children aged between four and 18 who were diagnosed with narcolepsy from January 2008 and who attended sleep centres across England. Researchers from the Health Protection Agency (HPA) and Papworth and Addenbrooke’s hospitals in Cambridge found that 11 of these had received the vaccine before their symptoms began. After adjusting for clinical conditions, the authors associated the vaccination with a 14-fold increased risk of narcolepsy. In absolute numbers, this means that one in 52,000 to 57,500 doses are associated with narcolepsy, said the authors. Since 2011, the use of the vaccine in people under the age of 20 across Europe has been restricted following reports of increased cases of the sleep disorder – which is characterised by periods of extreme drowsiness, sudden naps, and paralysis attacks.